An x-ray or imaging department contains many types of machines which create images of the body based on different technologies. Some of these are suitable for imaging breast tissue and others are not. The most suitable is the mammogram which uses x-rays. 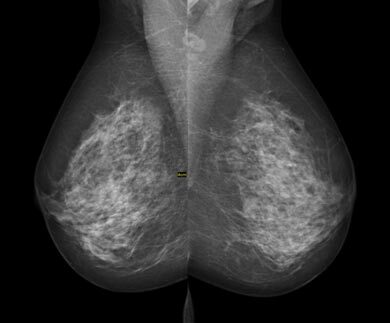 This is because x-rays are very good at distinguishing the difference between fatty and connective tissue and can show calcification which can be associated with breast cancer. Mammography is particularly good in post-menopausal breasts because these tend to have more fat, which shows up as dark on the mammogram; some cancers and calcification show up well against this dark background. Younger breast tissue contains more fibrous, connective tissue which shows up as white on mammography. Some cancers can be missed within this white background and alternative imaging can be used in these cases in addition to mammography. 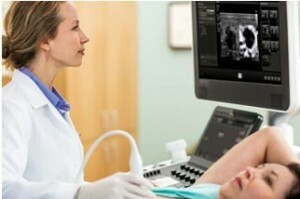 Ultrasound uses sound waves to make images and can be used to complement mammography. It can also be used in younger women, or those women with dense breasts when there is a suspicion of breast cancer. Ultrasound is not so good at showing up the tiny flecks of micro-calcification, which are one of the earliest signs of a possible cancer. Newer methods of ultrasound scanning are currently being looked at which produce an image of the whole volume of breast tissue in just 1 scan in each direction. This may become more available in the future but is still unlikely to replace mammography due to the issues already outlined. Magnetic Resonance Imaging (MRI) can also be used in certain circumstances. MRI is excellent at showing soft tissues in the breast and providing information about a tumour’s blood supply. It is normally reserved for complex cases, to assess the stage of a disease and for women who have had surgery. Breast MRI is not widely available in every Radiography department – it takes a relatively long time to do in comparison to mammography, and some women may find it unacceptable if they suffer with claustrophobia .